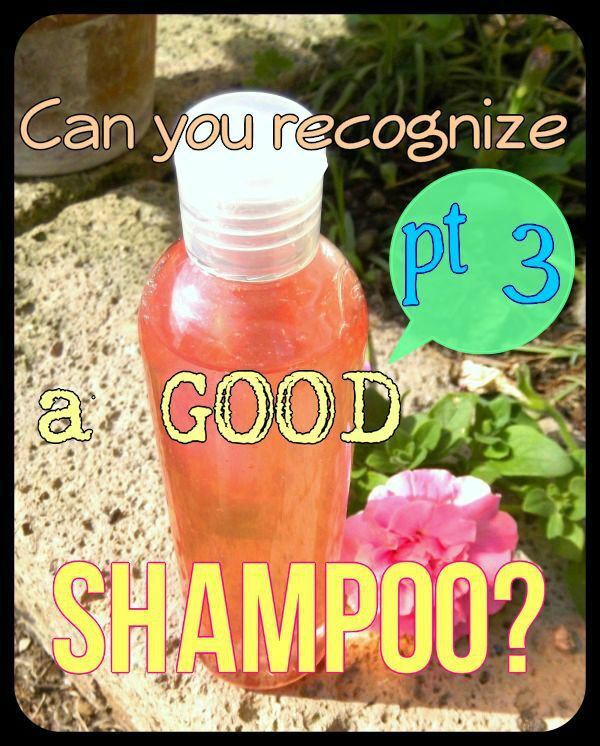 So here we are, with the third part of our “Can you recognize a good Shampoo” posts! (you can check pt.1 and pt.2). WARNING: I have been asked more than once to publish a list of good and bad ingredients (and explain why) but this really cannot be done. I don’t see things in black and it is very rare when a substance can be really considered 100% safe or 100% dangerous. Obviously I do have ingredients which I avoid and I don’t like, but I don’t want to be the one who says “you should avoid this too!!!”. There is already so much scaremongering about ingredients and it is not something I appreciate in general. – Guar hydroxypropyltrimonium chloride – it helps detangle the hair because of its antistatic property (it also helps the shampoo to be a little more thick). Usually used around 0.2% there are two “cousins” of this substance but I have never tried them and I don’t know enough to tell if they behave similarly enough to this ingredient: one is “hydroxypropyl guar” (which is still described as the first, but it is eco-friendly) and “hydroxypropyl guar hydroxypropyltrimonium chloride” (which should still do the job but, apparently, it is even less eco-friendly than the first). – Inulin – this is a good and “natural” ingredient which has conditioning properties. Up to 2% it is used to make the hair more straight. However, on thin hair which need a bit of volume it can have the bad effect of making the hair look even more heavy and powerless. So buy a shampoo according to your needs! – SILICONS – I will treat this argument very very briefly because this is not a post about them. Their main use in shampoos is because they are conditioning, they make the hair shine and they keep the hair all soft and smooth. It is also true that they are difficult to wash off and they tend to build up on the hair. My personal opinion (and therefore you are free to have your own 😉 ) is that silicons, on the hair and used in a small amount (the technical amount necessary to make them do their job) are fine. However when I say “small amount” I do mean it: one thing is to use a shampoo or a hair conditioner which contains a little bit of Quaternium-80 (even I add it sometimes at 0.5-1% in my recipes), another thing is to apply on the hair pure silicon (like “liquid crystals”). Therefore, when reading the INCI of a product, check in which position they are! If they are at the beginning, it is very possible that after few applications they will make your hair look heavy and without life (which is the truth, actually 😀 ). – EMULSIFYING AGENTS/FOAM BOOSTERS – They are often added to keep the shampoo composition more stable (often there are also a lot of oils in the formula and therefore they are needed), they also usually thicken the product and help making a very good foam. – PEG-10/PEG-200/PEG-150 (or actually PEG-whatever 😀 ) These are emulsifiers, thickeners and often also surfactants. They are considered not eco-friendly. They are often found in oil-based shampoos because they are powerful 😀 they don’t make much foam but they clean quite well. – NATURAL OILS, SYNTHETIC OILS – Oils are added to make the shampoo be milder on the skin because the grease “occupies” part of the washing ability of the surfactants, they also bring emolliency to the product. Therefore if you find a shampoo with oils in the first positions of its INCI, you can be quite reassured that it shouldn’t be an aggressive shampoo, however, I believe that a good balance of surfactants should still be there! Buying a shampoo made of water, SLES, olive oil and preservative doesn’t sound a good enough 😀 . You could find coconut oil, sunflower oil, olive oil, argan oil… as well as synthetic esters. The pH of the hair is around 4.5, therefore often we find citric acid or ascorbic acid which are added to lower the pH. – Benzyl alcohol, Dehydroacetic acid (this is commercially known as Cosgard, but on the INCI you will obviously read its chemical composition) T It is the one I use for most of my homemade cosmetics but I have learnt that it is not broad spectrum so I have substituted it now. It is considered eco-almost-friendly ( 😀 ) even though it cannot be considered like “fresh water” 😀 The % needed inside a cosmetic is around 0.5%-1%. It is not commonly found in cosmetics, but if you find a shampoo with this preservative combination, I would say it is fine. – Parabens (Butyl/Ethyl/Methyl/Isobutyl… Paraben) I guess I don’t need to say anything against Parabens since nowadays they are rarely found in cosmetics anymore (once again, because of the huge scaremongering about them). Personally I don’t believe they are so bad as they seem to be (at least in a shampoo, which is a product which you rinse right after), but since now we can have a choice to pick something better, why not. There are obviously much more preserving systems but I will write a post about them separately. Those which are supposed to give good results! Thank you for the great post. May I ask you what could add to shampoo recipe to make hair softer? My shampoo recipe cleanse finely but the hair after that is dry. I want to avoid silicone. Thank you. The dry feeling left by the shampoo depends by the combination of surfactants, so I’d change surfactants in the first place. Thank you. It is a surfactant blend from a company which I like, unfortunately. Is there a more conventional way to fix it like adding protein, honeyquats? I tried adding Hydroxy guar chloride but it seems make hair and scalp greasy faster. Changing surfactants is the best way. Everything you add won’t repair the fact that the blend isn’t hair-suitable. I believe you can use this surf blend for body or face products, but avoid the scalp. If you have a dry scalp and use a drying surf blend on it… Nothing can help. It is just not the right blend for your head. Polyquat 7 is my fav, there is also Polyquat 10 and Quaternium 80 (but it is a silicon).